A White House official faced a testy hearing while appearing before a Senate committee to explain and defend the Trump administration’s proposals to reform and reorganize the federal government, with lawmakers criticizing officials broadly for failing to offer insight into the analysis that shaped the plan. The White House released the 32 proposals last month, but Office of Management and Budget Deputy Director for Management Margaret Weichert said the suggestions were merely preliminary submissions and therefore details were not yet necessary or helpful. The reorganization plan was intended to start a dialogue, Weichert said, but she repeatedly declined to offer specifics into how it was formed, what implementation would look like and what it would cost. Senate Homeland Security and Governmental Affairs Committee Chairman Sen. Ron Johnson, R-Wis., and ranking member Sen. Claire McCaskill, D-Mo., repeatedly butted heads as to the purpose of the hearing and the responsibility the administration had to be more forthcoming with information. Weichert, for instance, said there were 10-12 proposals that the White House could institute without legislation, but rejected multiple attempts to solicit all of them. She said some agencies had provided OMB with cost analysis of eliminating or merging their organizations, but that data was “predecisional” and therefore not appropriate to share with the committee. McCaskill said the proposal was “woefully short on details,” and no private sector company would go before its board with recommendations for transformative changes without providing more analysis. The chairman pledged to demand all the same information as McCaskill in due time. Weichert similarly promised to deliver what information OMB deemed appropriate as the public discourse unfolds. 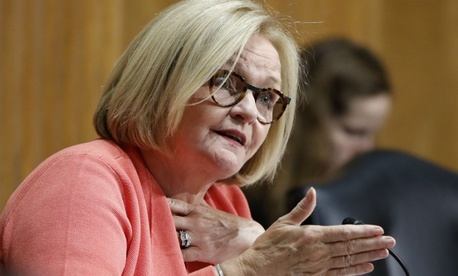 McCaskill responded by asking what the point of the hearing was if not to start that discourse and solicit that data. Weichert did provide some details on the origins of OMB’s proposals, saying 20 of the 32 were in some way derived from Government Accountability Office reports and 13 of them were nearly identical to GAO recommendations. She cited transfering background check responsibilities from the Office of Personnel Management to the Defense Department, improving the customer experience and standing up a private-public partnership within the General Services Administration as examples of steps the White House could take on its own. She at one point testified that 10-12 proposals could take place unilaterally, but later suggested 30 of them would require legislation. Sen. Heidi Heitkamp, D-N.D., pressed Weichert for details such as whether the Postal Service weighed in on the White House’s suggestion to privatize the agency or whether the Agriculture Department itself proposed moving the nutritional assistance program to the Health and Human Services Department, which Weichert declined to answer. “If you really want this to work, you’ve got to form a greater partnership with us,” Heitkamp said. Weichert heard bipartisan pushback on a number of proposals, including the food stamps change, merging the departments of Education and Labor, privatizing the Postal Service, shrinking the Army Corps of Engineers and changes to the Small Business Administration. Republican senators, however, were largely supportive of the administration's broader efforts. Weichert reiterated a previous suggestion that the goal of the project was not to cut any federal jobs, though she acknowledged some employees may be “dislocated” by reform efforts. She said she did not have an estimate into how many jobs would be lost. Weichert acknowledged the plan initially did call for shrinking the federal workforce, but after the administration dove into the process it realized it faced a much more significant challenge in planning for future retirements. McCaskill emphasized that few of those proposals will be implemented if the White House is not more forthcoming with Congress.